WWI Profile: Benjamin Bantie Smith 1893-1918 | Friends of Fort Caswell Rifle Range, Inc.
Benjamin Bantie Smith was born and raised in Brunswick County. There is a partial family tree in FamilySearch. His WWI Draft Registration from June 5, 1917, shows he was single and working on his family’s farm. 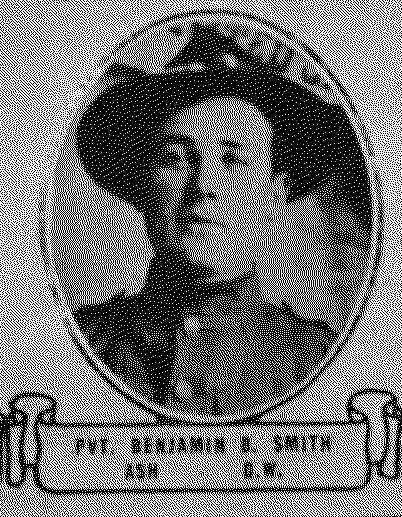 Benjamin B. Smith was one of 16 Brunswick County men ordered to report for duty on September 19, 1917. Included were John Carlisle, Samuel G. Fulford, James R. Ganey, and William P. Comron/Cameron, who were all eventually assigned to 119th Infantry, 30th “Old Hickory” Division, to train at Camp Sevier, Greenville, SC. Previous posts described events up to and including the Hindenburg Line assault. At 5:50 AM on the morning of September 29, 1918, the North Carolinians of the 30th Division—then serving under British command as part of the Fourth Army—emerged from the safety of their trenches and formed up in a single line, each man standing shoulder to shoulder, roughly four to six feet apart. As they moved across the field under a cacophony of machine gun and artillery fire, the men did their best to stay abreast and maintain unit cohesion. Due to the poor visibility, the difficult nature of the terrain, and battlefield obstacles, however, the lines began to waver almost immediately. Enemy artillery fire punched at the Allied lines as a thick cloud of fog and smoke enveloped the field. “[Y]ou could hardly see your hand before you,” remembered Luther Hall, a Surry County native attached to the 119th Infantry Regiment. Also included was this description. The field over which this fight took place, on the 30th day of September, presented a miserable appearance, as dead soldiers were scattered broadcast over its area. Shell holes were so numerous that one could not walk three steps without falling into one. Huge masses of barbed wire had been partly cut by the bombardment and the Tanks. Not a telephone pole nor a tree had been left standing by the sweeping Artillery fire. The town of Bellicourt was a complete wreck. Pvt Benjamin Smith died of his wounds on October 17, 1918, over two weeks after the Hindenburg Line assault. On November 18, 1918, he was recommended for both a British and American military medal. Pvt Benjamin Smith was awarded the Distinguished Service Cross (pictured left) by the United States Army for great bravery in battle. His NC WWI Service Card and page 8 of the 119th Infantry military honors recommendations list shows he was also awarded the British Military Medal (pictured right). On July 8, 1918, the United States Congress approved an act permitting members of the military forces of the United States serving in the World War to accept and wear certain foreign decorations. 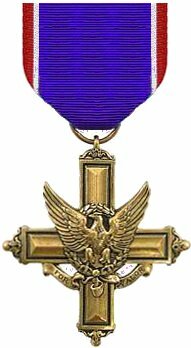 This is an example of a Distinguished Cross Citation that Private Benjamin Smith would have been awarded. 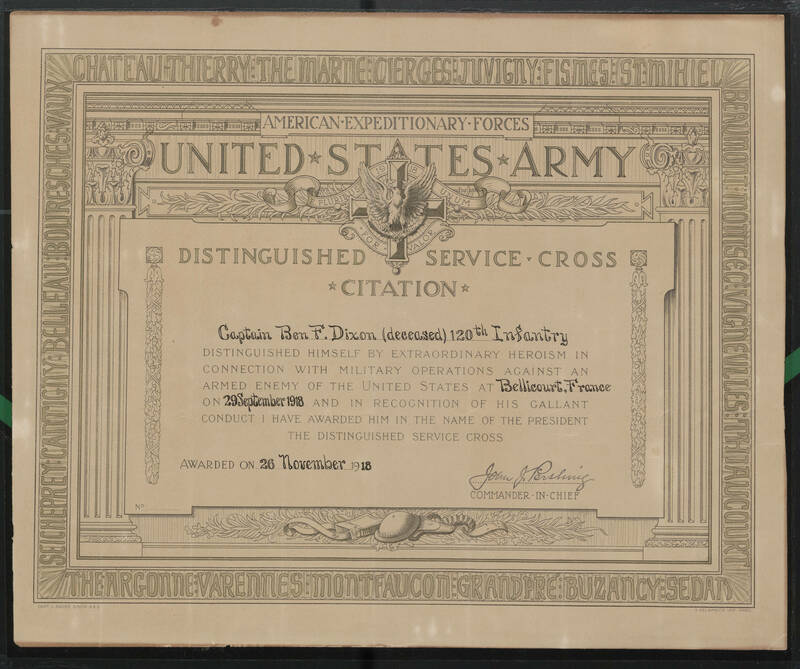 This citation was awarded to Captain Ben F. Dixon, who was KIA during the same battle to break the Hindenburg Line. BENJAMIN B. SMITH, private, Company A, 119th Infantry. For extraordinary heroism in action near Bellicourt, France, September 29, 1918. After being wounded twice in making attacks with his own organization, he joined Australian troops and attacked with them, being wounded a third time before he consented to be evacuated. 73,000 . . . . . men in the Army. 9,000 . . . . . men in the Navy and Marine Corps. 1,600 . . . . . men gave their lives. 1 . . . . . man awarded the Congressional Medal of Honor. 200 . . . . . men awarded the Distinguished Service Cross. 12 . . . . . men awarded the Distinguished Service Medal. 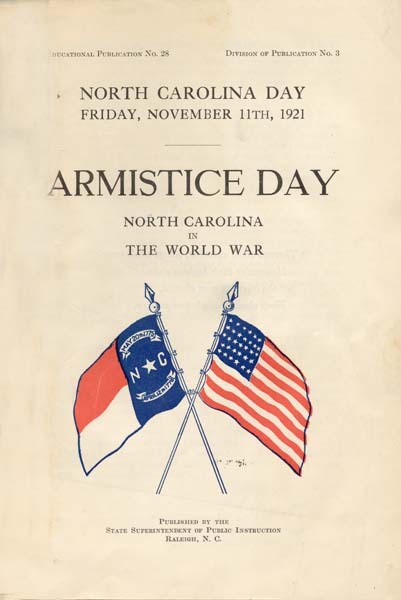 Eighty-two thousand North Carolinians fought in the war. One thousand six hundred of these gave their lives in battle. These are the men whom we should especially honor today. Some day their names and homes will all be known. But scholars will have to work a long time to get them all right. In the meantime you should learn as many as you can of the men from your own county who died. Their names should be read on Armistice Day, and hymns sung and prayers offered in their memory. Some of these men have been brought back from France and are now buried in their home cemeteries. Their graves should be visited this day, and decorated with flowers. Remember that these men died for us, and honor them always.